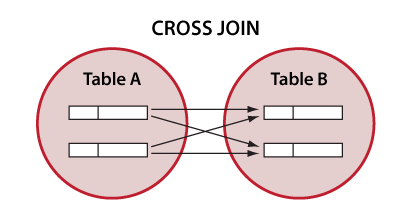 A SQL JOIN is a method to retrieve data from two or more database tables. 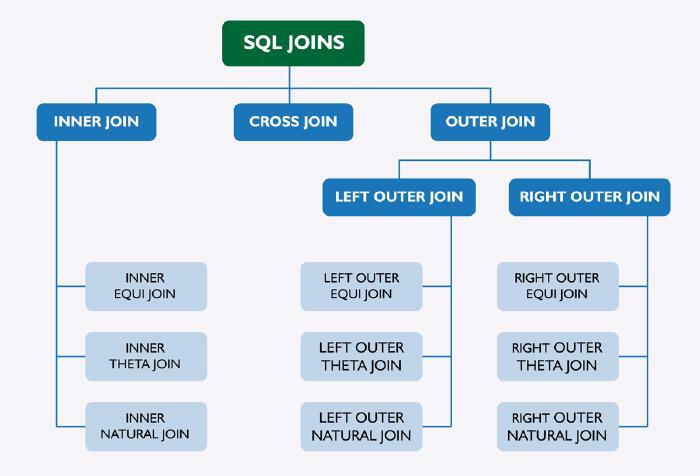 This article presents a basic overview of what data from a particular SQL join will look like. 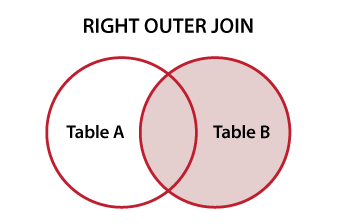 A popular way of understanding SQL joins is to visualize them using Venn diagrams, so each example have corresponding Venn diagram, appropriate SELECT statement and the result table. theta, which will be described later. For the purposes of this article, let’s discuss joins using a simple example. 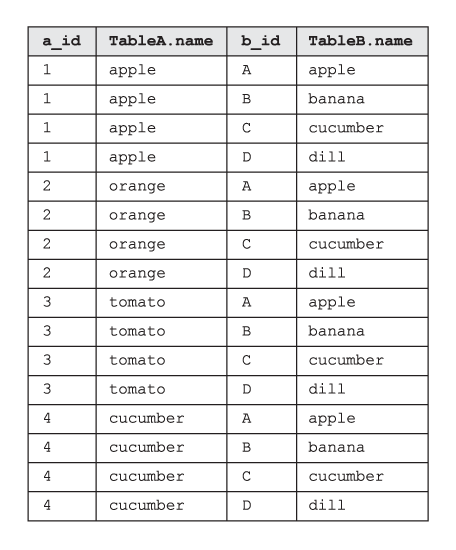 Assume that we have two basic tables, TableA and TableB, which are filled with some example data. Since we’ll be joining tables on name column, we distinguish the rows of the same name by highlighting them red. In the following sections, we’ll look at what happens to this data when different types of joins are implemented. A CROSS JOIN is a Cartesian product of TableA and TableB. Every row from TableA is matched with every row from TableB; that’s why a CROSS JOIN doesn’t make sense in most situations. 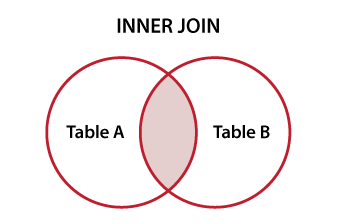 An INNER JOIN merges ONLY the matching rows in BOTH tables. 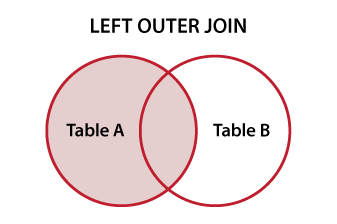 A JOIN without any other JOIN keywords (like INNER, OUTER, LEFT, etc) is an INNER JOIN. Results are found in the overlapping area. 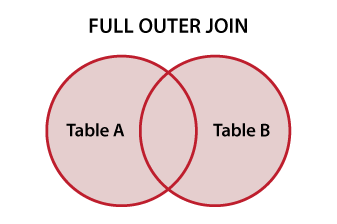 FULL OUTER JOIN returns matched and unmatched rows from both tables (it’s an union of both). If there is no match, the missing side will contain null. 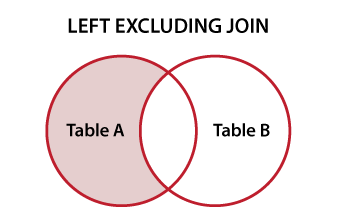 A LEFT OUTER JOIN returns all rows from the left table (TableA) with the matching rows from the right table (TableB) or null – if there is no match in the right table. 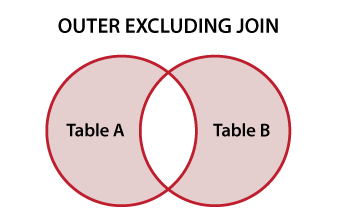 A RIGHT OUTER JOIN returns all rows from the right table (TableB) with the matching rows from the left table (TableA) or null – if there is no match in the left table. 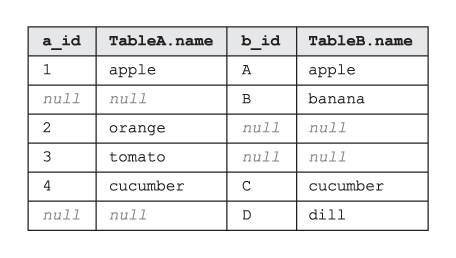 This JOIN is made by using the equality-operator (=) to compare values of the PrimaryKey of one table and the Foreign Key values of another table. This is the same as the equi JOIN but it allows all other operators like >, &lt, >= etc. 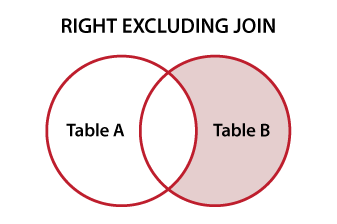 This type of JOIN is usually used in case of a unary relationship type, where a table is combined with itself. A NATURAL join is a type of EQUI join. There is no need to use an ON clause. Columns with the same name in associated tables appear once only. By manipulating keywords we can exclude specific data. An OUTER EXCLUDING JOIN returns all of the records in TableA and all of the records in TableB that don’t match. A LEFT EXCLUDING JOIN returns all of the records in TableA that don’t match any record in TableB. A RIGHT EXCLUDING JOIN returns all of the records in TableB that don’t match any records in TableA.